This section is so called as it may not be pretty to watch. We could have slow play. We could have deliberate pauses on doubles. We could have gamesmanship. We could have bouts of missed doubles and general poor play. 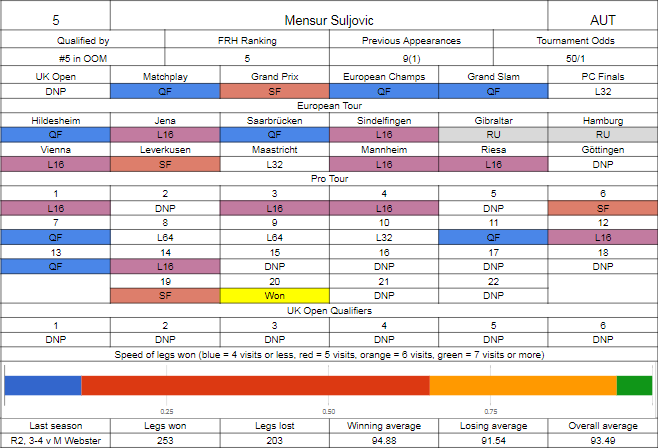 But if anyone is going to solve that, it's Mensur Suljovic, your 2017 Champions League winner. The now hugely popular Austrian has claimed a TV title and it's not before time, the key wins being over Gary Anderson (twice), including in the final which wasn't of a great standard but he kept doing enough. In the ranking events, he wasn't able to make any finals, but had a solid record apart from not playing any of the UK Open for personal reasons, and coming undone in Minehead to an uptrending Stephen Bunting last month. Between then, he did more or less what could be expected - a quarter final in Blackpool, which he might have been able to turn into a semi final but Gurney was just that little bit better on the day, the same in the Grand Slam where he lost a close game to Gary Anderson, the same in the European Championship where he was another to fall victim to an in-form Kyle Anderson, and peaked in the Grand Prix, where he lost a deciding set in the semi final to Simon Whitlock at a stage where anyone who was left could realistically have won. On the floor he's been his usual great self, putting together a very solid European season with two finals, and after cutting down the Pro Tour later in the season, warmed up in Ireland by taking a Pro Tour win, including a win over van Gerwen in the quarter finals. 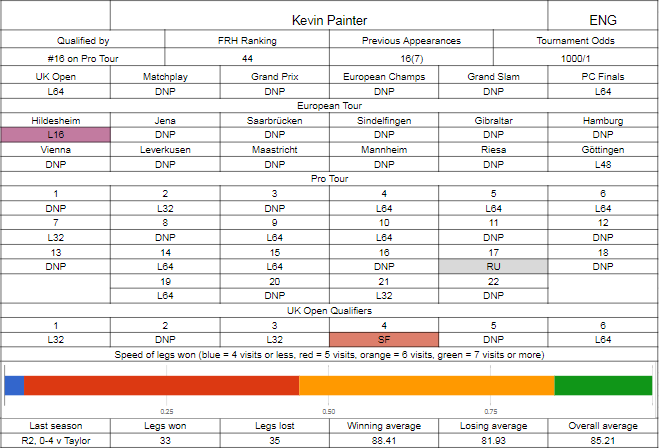 Painter is here, just, yet again, being the final qualifier in the Pro Tour rankings, although this time on merit rather than due to Kyle Anderson having visa troubles. His best work was arguably early in the season, comfortably qualifying for the UK Open, primarily on the back of a semi final run in event four, knocking out, amongst others, Gurney, Jenkins, Barney and Smith before finding Michael van Gerwen a step to far, as most do. The event itself gave him a winnable match against Chris Dobey, but Chris was good enough to nick it 10-8. That was the only major he'd play until Minehead last month, where a moderately low seed gave him James Wade, not the toughest opponent he could get, but one that was good enough to beat him. Nowhere near Hasselt having qualified for just two events, the first and the last, the first was at least good to him with a run to Sunday following a deciding leg win over Stephen Burton and a solid victory over Simon Whitlock, whereas the other wasn't great, losing in round one to Andy Boulton. This left the Pro Tour, where he did at least reach one final in August, not needing to beat anyone better than Gerwyn Price to get there, but aside from that run it was a string of early exits, not winning his board once and only reaching three board finals. Can't help but feel that Painter may be in his last appearance here, he's only just made the last two years and he doesn't seem capable of stringing together enough consistent runs. He's also got probably the worst possible draw - if there's one player that isn't going to be affected by Painter's (perfectly legitimate) occasional tricks, it's Suljovic. Painter's not going to be able to clean up enough legs quickly enough to stand much of a chance in this one, if he has a purple patch maybe he can grab a set, but I think that's about as much as he can do. 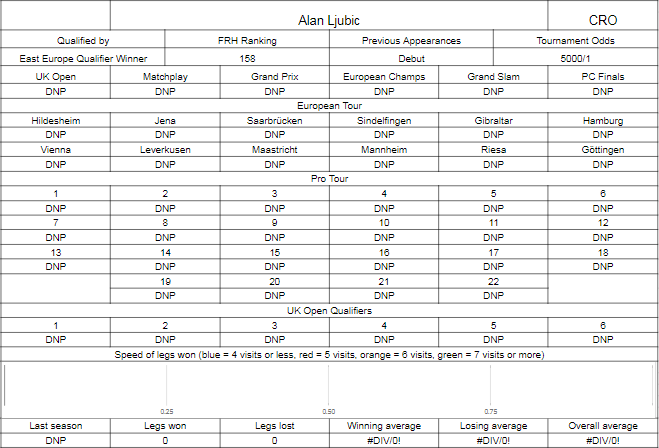 A tenth appearance here for the multiple major winner, although this is with his worst seeding since 2012, where he was one spot ahead of Mark Dudbridge. With the Grand Prix win now a long time ago, we just need to look at the present - and he's not had too bad a record on the floor, reaching the last sixteen on nine occasions, the bulk of them being in a good run between the UK Open, where he crushed a poor pub qualifier but won just two legs against Joe Cullen, and the Matchplay, where he was comprehensively outplayed by Cristo Reyes. That floor run included one final, but he only played two players who are at Ally Pally - Steve Lennon in the first round, and Michael van Gerwen in the last. The highlight of his season was the Grand Prix - he shouldn't have even been there, but Taylor withdrew to let him in, and to be fair he made the most of it, getting through Kim Huybrechts and Dave Chisnall before not doing quite enough against Daryl Gurney. Last time out in the Players Championship Finals, he just got through James Richardson, surviving a match dart despite being on a nine darter in the leg, and then lost to Chris Dobey. 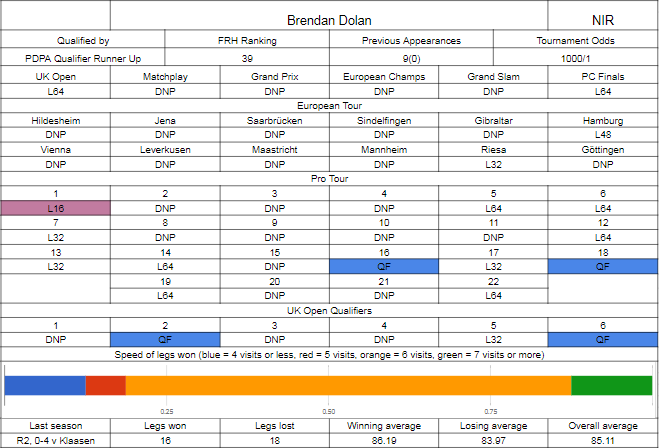 Dolan's another player whose career seems to be on the same trajectory, except without the same peaks (although they do both have a double in nine darter, of course) - making a tenth appearance here, although he didn't do enough this year to either maintain his position in the seeds or to make it through the Pro Tour rankings. He wasn't far off either, but needed the PDPA qualifier to make it, getting past Jamie Lewis in a deciding leg in the critical game, but not getting close to Ted Evetts in the final to reach the first round proper. His season started well - two quarter final runs in the UK Open qualifiers saw him reach the money automatically, and he followed up with a board win on the first Pro Tour event in the run up to it, but lost a tight game 10-9 to John Michael to not make it any further. He'd then have a disastrous run through to July, losing out in a bunch of European Tour qualifiers and losing 6-1 to Pete Hudson in the one he did make, but a spurt of two out of three Pro Tour events with a quarter final run would at least get him to Minehead later in the season, sandwiching in a second European Tour qualification, in which he whitewashed Andy Hamilton but then lost to Jelle Klaasen. He did show some hints that he may be getting a bit of form going, only just losing out to Mervyn King in Minehead, then obviously doing enough to qualify. Ljubic, like many in his area, is a tweener switching between steel and soft tip, who had a couple of goes at European Tour qualification, but lost to Ratajski on both occasions. Relatively unknown, he entered the Eastern European qualifier which was widely dubbed the Krzysztof Ratajski qualifier, and at the semi final stage it was looking that way, but then Ratajski surprisingly lost to his namesake Kciuk, a Pole who'd previously played the PDC worlds in 2010, which opened the door to Ljubic, who stepped through and comfortably beat Kciuk 6-2 in the final, having beaten little known Slovenian Ben Pratnemer in the semi finals and "Cheeky" Nandor Bezzeg in the quarters. I've just watched a video of Ljubic playing soft tip against Boris Krcmar and his standard doesn't seem too bad, but in the steel tip game against a veteran like Dolan this may be a bit too much of an ask to be able to hit enough consistent trebles and stay close. 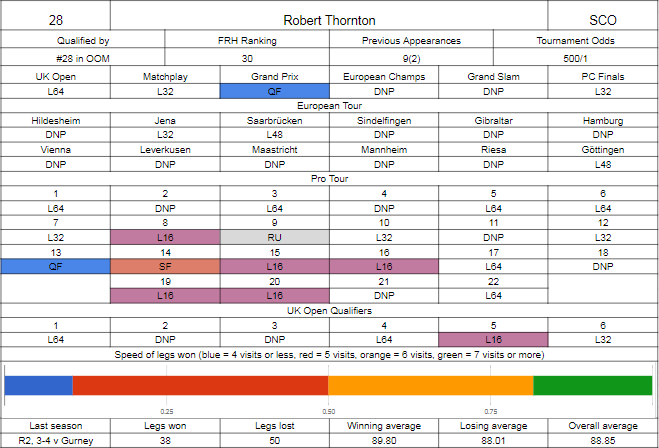 Thornton should have enough to get through either qualifier, his form's somewhat better than it was this time last season, but he's going to have to produce it, Dolan's got to be somewhat confident having come through the qualifier and the bookies are listing it, accounting for the relevant chances of winning through the prelim, at around 60/40, which I think could be a little unfair on the Scot, but as stated, he'll have to turn up.